For the week of March 11th, we visited the A3 IT department! Mrs. Missy Rice is the PowerSchool Coordinator for Anderson Three! She has been with the district for over 11 years. Being behind the scenes, Missy isn't always in the spotlight. 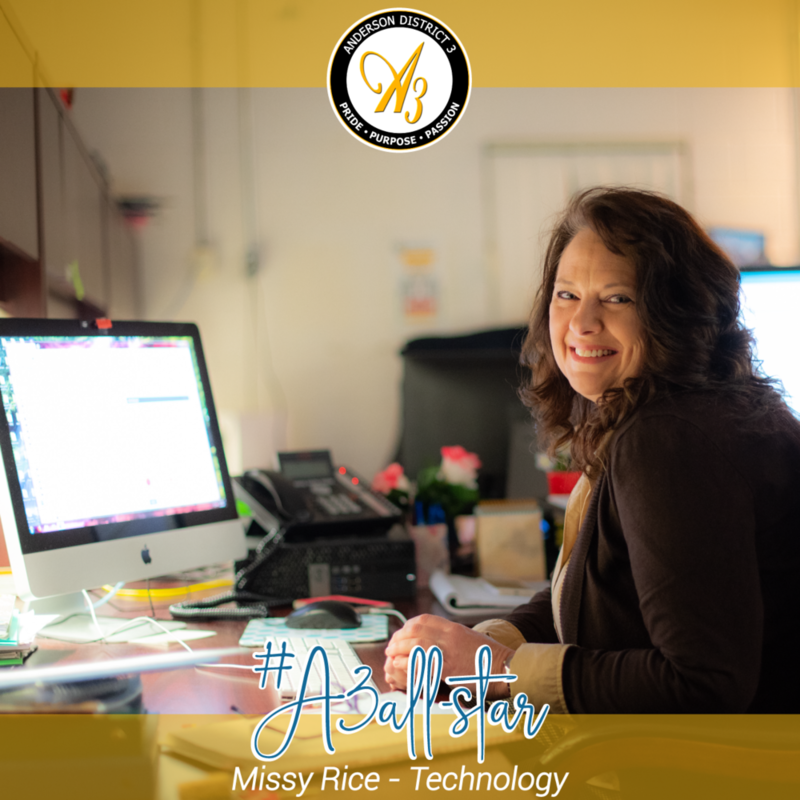 She works diligently in the IT department coordinating every aspect within PowerSchool for the entire district. PowerSchool powers grades, attendance, scheduling and data. Missy powers PowerSchool, including importing and exporting school data and assisting with state reporting. -What do you like most about your job? "I enjoy working with PowerSchool. I wear many other hats other than PowerSchool but I enjoy each task that I am given and try to do my best to help others when I can. If I can make someone else's job easier then I've had a good day. My favorite part of my job is creating object reports. I work with the best team in A3!" "I have been married for 27 years to my strong supportive husband Seath and we have 2 children, Cory and Ashley. Cory is a Machine Maintenance Technician at TTI and Ashley is a sophomore at Lander University in the Nursing program. We also recently had a new addition to our family, a Great Dane, Ruger. I enjoy cooking, reading and spending time with my family!" Missy is also a 12-year breast cancer survivor! We are incredibly grateful to have Missy behind the scenes, powering our district in a very important way. Thank you, Missy, for everything you do to support the students and faculty of Anderson School District Three.